© Equitopia, from video tutorial Is your horse struggling from an ill-fitting bridle? A British charity has given the stamp of approval to Dressage New Zealand after it introduced a ruling to prevent over-tightening of horses’ nosebands in competition. The move follows a ruling by the Danish Equestrian Federation last year over noseband tightness. Blue Cross, a charity that provides treatment and homes for unwanted or abandoned pets, has welcomed the new rule. “Dressage New Zealand gets a ten from Blue Cross for following in the footsteps of the Danish and we hope many other competition bodies will join them to give a consistent message, and cause people to think twice about how we are training our horses,” said Blue Cross senior horse rehoming manager Rosie Mogford. Tight nosebands can cause damage to nerves. © Equitopia, from video tutorial Is your horse struggling from an ill-fitting bridle? “Our charity believes it should never be common practice to use pain as a means of control, particularly as the principles of dressage are predicated on harmony and lightness. Tack, ie, bit, bridle and curb chain should not be so tight that is uncomfortable on initial fitting. “Classical training methods and good sense demand that if resistance persists, the trainer needs to address the root cause of this rather than tightening the tack and stepping up the pain caused,” Mogford said. 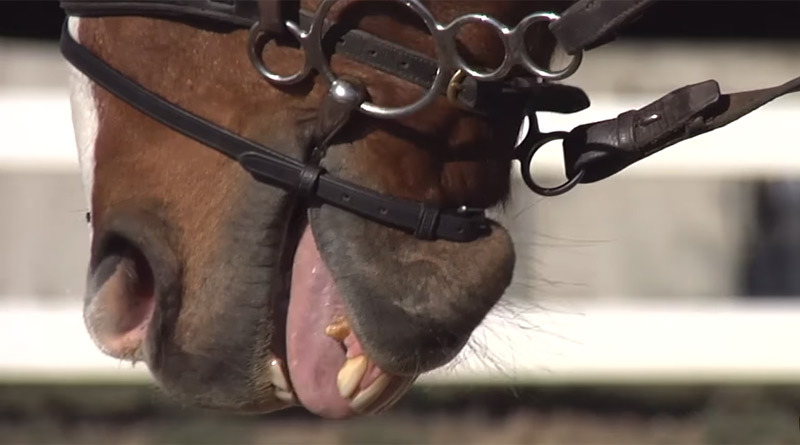 A horse clearly having difficulty breathing due to the extremely over-tightened flash noseband. Dressage NZ Technical Officer Scott McKenna said the previous rule did not adequately prohibit tightening of the noseband to a point that has been shown to be harmful to the horse. “The more common ‘two-finger’ standard was considered but the scientific literature shows that one finger is adequate,” McKenna said. In other rule changes relating to welfare, Dressage NZ said the Chief Judge “may stop a test at any point and eliminate the rider if for any reason the Judge believes it is contrary to the best interests of the horse and/or rider to continue the test”. The passage has been added into Article 454, covering lameness, blood or welfare concerns. McKenna said the purpose of the new rule was to provide a catch-all type provision to allow a judge to stop a test if necessary for a reason that is not anticipated elsewhere in the rules. The rules already state that “Any horse that shows lameness while competing will be eliminated. The Judge or Chief Judge will ring the bell to stop the test and explain the reason for the elimination to the rider. There is no appeal from this decision”. Examples of measurement angles, as supplied by the Danish Equestrian Federation.